The journey continued and I asked him about his past-time hobbies. Suddenly he noticed my headphones that I was holding and asked me what I was listening. He wanted to know whether it was some talks by great men on meaningless life or just music. I told him I listen to both. But now I am listening to great soothing and relaxing music. I asked him what kind of music he likes. He said that he was not an ardent or passionate music lover nor did he have great knowledge about music . But added that he was not against listening to some good folk songs or bhajans. I inferred that he was not totally deaf to music. Then I told him that music can really bring a great positive change from his current stage of depression and loneliness. A person do not require a deep knowledge in the Art of Painting, just to enjoy the beauty of colours and flowers in a garden which is well painted in a canvass. Similarly a person with no knowledge in music can still enjoy the art which presents itself in a variety of forms like Folk, Bhajans, Film Songs, Instrumental, Carnatic etc. Coming back to the topic of Senior Citizens, as the cells become grey and old, new problems surface. They have more aches and pains. They tend to not sleep well and they start to have issues with mobility, coordination and cognitive functions.To add to the toll, they have to accept the ground reality that one day death embraces one of the life partners first leaving them in an emotional trauma and depression. On the contrary, there are also healthy senior citizens with no issues of mobility or depression or memory problems. 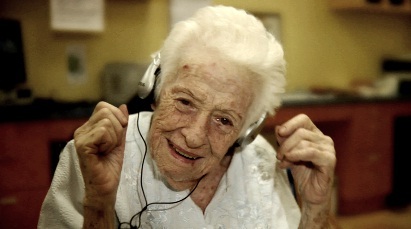 The good news is that, music helps everyone including senior citizens in all these areas. What is the fact behind this ? Music has a direct effect on the nerves. The Nada produced enters the atmosphere and remains there as a positive vibration that penetrates the human system through sense organs. The ears first receive it fully and pass on the musical impressions to the brain. The brain then passes on these pleasant musical impressions to the entire human system affecting every cell and fibre in the body. This is reciprocated by an immediate relaxing effect on the mind and body and goes further to touch the soul..Specially soft and slow classical music have a beneficial effect on the heart rate, lowering of blood pressure,reducing the levels of stress, distracts the mind from negative thoughts and improves memory .Research had proved that listening and learning music will result in an increased release of dopamine in the brain, and dopamine is well known as a “feel good” neuro-transmitter. Let us encourage our parents to listen to music. Offer them their favourite choice of music to keep their brain cells stimulated. Buy them a collection of songs which they used to sing around when they were young. If they are interested in learning some instruments or vocal music, let us do the needful for them. Let us organise some get-together or a small Bhajan Sandhya in our home occasionally were music is the main activity. Here we can ask the senior members to form a group and present songs. Some can play instruments and some can sing. When such a function is arranged, the seniors will find time to select songs and begin practice days before the event.These musical activities will bestow them with a healthy mind and healthy body which gives them a feeling of purpose, achievement and happiness. Appreciating and enjoying music is God’s gift to us, to tide over all the negative situations in our life. When we encounter any setback in our life, the first thing we do is to complain- Why this happened to me O! God, I trusted you so much ! You left me in despair. We complain to GOD -YOU closed the one and only window that gave me fresh air ! But the UNIVERSAL POWER whom we call as GOD is never cruel to anyone in this world. If GOD closes one window, he would have opened a very big door before closing that window. It is for us to look around and locate the door that is opened for us. HE is the only one who takes care of us in all our adversities. Inspite of doing all favours to you HE never complains that you are not thinking of HIM ! HE is waiting for you endlessly with all love and affection -that too without wanting anything from you. When we want to offer something to God out of love for HIM, it is worship. But when we stand before GOD as a helpless child or a humble servant, asking for help, it becomes a Prayer !.This is the difference between a prayer and worship. Worship and Prayer are opposite in nature. But both born of sheer love, faith and sincerity. Again Life is a mixture of opposites. Death walks side by side with life, illness walks behind health, poverty hang around behind wealth, disgrace or shame wait to pounce on fame, enmity stalk friendship and frustration always challenges hope ! To tide over all these opposites, ordinary mortals like us do a combination of worship and prayer (which are again opposites) born of love to GOD. When GOD loves us very dearly HE worships us..HE will do anything for you. But this is one state where one should qualify himself/herself to reach to this particular level, where GOD is waiting to serve you. This state can be achieved through SELFLESS SERVICE AND SELFLESS WORSHIP ! When a person reaches this level, there is very little materialism in his personal life. Whatever he or his family needs is automatically being taken care of. That’s why MUSIC or NADOPASANA is being regarded as the ultimate form of WORSHIP ! This art form bestows you with the spiritual qualities of purity, forbearance, self-control and compassion completely wiping off the element of selfishness or EGO taking you closer to GOD ! To do all this, we have to accept and trust Music as our Saviour ! The power of acceptance and all its positives can be experienced only when you ACCEPT AND TRUST . Acceptance requires Trust. Don’t wait to see GOD to accept HIM. ACCEPT HIM WITH ALL TRUST – AND EXPERIENCE THE DIVINE GRACE. Same is the case with Music. MUSIC IS DIVINE. Accept and embrace soft and soothing ragas and experience the bliss physically, emotionally, intellectually and spiritually !. You don’t need to analyze the process – just trust music and listen and see the amazing result ! .